Have an iPhone® 5 or other Apple portable that uses the new Lightning connector? With this handy adapter you can still use your new device with your current gear with built-in docks. 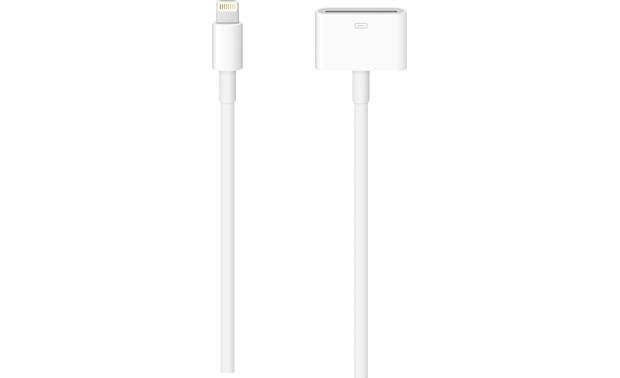 The cable features a female 30-pin connector that plugs into the docking port, and a Lightning connector for your Apple portable. Does this cable support charging and audio out? Overview: The Apple Lightning to 30-pin adapter cable lets you connect Apple devices with a Lightning connector to many Made for iPod 30-pin accessories (some 30-pin accessories are not supported). This adapter cable supports analog audio output, USB audio, as well as syncing and charging. Video output is not supported. Will it keep steering wheel controls? It does for us. We have it between an iPhone 5 and an older Kenwood receiver. Shawn, Yes it does both. I bought one to play from my iPhone to an old Bose SoundDock. Plays and charges at the same time.